J.H. Weaver’s home (“Maroebe”) in Merion, Pennsylvania. John Heisley Weaver was born May 15, 1860 in Williamsport, Pennsylvania, the son of George and Elizabeth (Heisley) Weaver. A prominent businessman in the area, George was a dealer in salt, lime, plaster and cement. Although he had the means to offer his son educational advantages, the elder Weaver educated his son through the Williamsport public school system. J.H. Weaver found his first employment with the Western Union Telegraph Company as a messenger. He next joined the Pennsylvania Railroad Company in the same capacity, quickly advancing to a clerkship. He then worked for the Williamsport Iron & Nail Company in a managerial position, and eventually went to the Donaldson & Thomas, Coal & Coke Merchants of Philadelphia as a salesman. By the age of 25, Weaver had become president of a bank then known as the West Philadelphia Bank. But the coal and coke business seemed to offer him the most rewards. Working as an agent representative for large mining operators, he was successful enough that in 1889, he formed his own business – J.H. 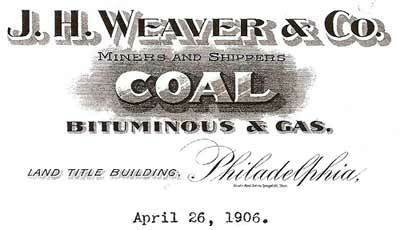 Weaver & Company, Handlers of Coal and Coke, based in Philadelphia. As early as 1899, Weaver was purchasing coal properties in western Pennsylvania (in both Indiana County and Cambria County) and northern West Virginia. By 1904, Weaver had considerable holdings in Pine, Green, and Cherryhill Townships (Indiana County) and was ready to begin building his own “model town.” Located in Pine Township, he named it “Heilwood,” which was probably a combination of his nickname (“Heil”) and the name of his first coal mine in Kingwood (Preston County), West Virginia (“Heisleywood”). With an initial capital investment of $100,000, Weaver began building homes and businesses in this rural area. By 1906, with six mines in operation producing over 112,000 tons of coal, Weaver divested himself of the entire operation, selling it to the Pennsylvania & Maryland Coal Company (aka Penn Mary Coal Company) for a reported $1.8 million dollars. Heilwood was just one of the many coal and railroad-related businesses Weaver was involved in throughout the region. 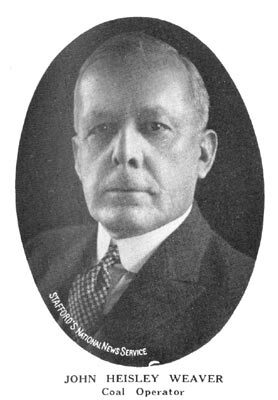 To facilitate movement of the coal from his West Virginia holdings, Weaver became the founder and president of the West Virginia Northern Railroad. Weaver also purchased both the ‘B’ and ‘D’ seams of coal on land owned by the Hines Coal Company around Starford, Pennsylvania, a town on the Cherry Tree & Dixonville Railroad (named after James Starford, one of Weaver’s mine superintendents). The Hines Coal Company drove five headings (No. 1 through No. 5) around Starford, but by 1911 newspaper accounts report that the Starford mine was “worked out” and that some houses were being torn down and taken to Colver to be rebuilt. After divesting himself his holdings in and around Heilwood, Weaver purchased the Dixon Coal Company at Idamar (four miles north of Clymer, Pennsylvania), also on the Cherry Tree & Dixonville Railroad. Around the year 1909, Weaver became partners with B. Dawson Coleman and together they began to buy and invest in coal properties in Cambria County, Pennsylvania. The two men first acquired the Nanty-Glo Coal Company and its two mines. In 1910, they purchased the Ebensburg Coal Company and opened the Colver Mine. In addition to the coal lands, they purchased an old logging railroad called the Blacklick & Yellow Creek Railroad in Cambria County, which in 1911 became known as the Cambria & Indiana Railroad when it was extended into Indiana County. The C&I later connected to the New York Central at Manver (now known as Pine Flats), Pennsylvania. During the construction of the Panama Canal from 1904-1914, J. H. Weaver & Company was called upon to supply coal to power the project’s construction equipment. According to the Canal Commission’s report, “… all orders were fulfilled very satisfactorily and with great dispatch.” With their success at the Canal, Weaver greatly increased his foreign export of coal. In 1915, the Heisley Coal Company was established to operate the Nanty-Glo No. 3 mine. The following year, the Monroe Coal Company was formed in order to oversee the operation of the newly opened Revloc Mine. Together, the Colver, Revloc, and Nanty-Glo mines were among the most productive in Cambria County, and remained in operation for over 50 years. In 1922, Weaver and Coleman dissolved their partnership, with Weaver gaining control of both the Heisley Coal Company and the Monroe Coal Mining Company. Weaver also retained a controlling interest in the Cambria & Indiana Railroad. Coleman took sole ownership of the Ebensburg Coal Company and its related pieces. 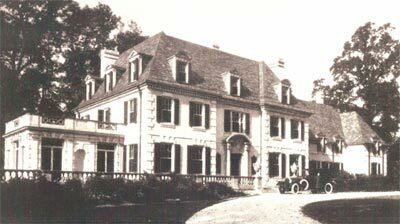 With his business successes, Weaver purchased the home of a former Pennsylvania Railroad president, Frank Thomson, in 1921. The 15-acre property was located along the exclusive “Main Line” in Merion, Pennsylvania (outside of Philadelphia), and Weaver soon had the original home “Corkerhill” demolished, in order to build a new home called “Maroebe” (named after his two daughters: MAR-ion and ph-OEBE (see photo at right). Horace Trumbauer, a prominent architect known for his conspicuous shows of wealth, designed and built the new house. It was reported that many of the furnishings and the wood used to finish the interior were imported from Europe. There was a staff of 29, including a watchman for the grounds, a personal maid for Mrs. Weaver, and a valet for Mr. Weaver. There was also a personal railroad car for Weaver kept at the Overbrook Station on the Pennsylvania Railroad. Weaver also had a summer home in Ventnor City, New Jersey. During World War I, Weaver was very active in various patriotic affairs, and did much to expedite the movement of coal to the Allies. In recognition of this activity, the King of Italy conferred on him the “Order of a Knight of the Crown of Italy” in 1921. This award was designed to honor military men, but was also given to foreigners as a reward for signal merit and direct interest in Italy. Weaver accepted the honor from Rolandi Ricci, Italian Ambassador to the United States, at a dinner at the Hotel Biltmore in New York City. In 1924, Bucknell University awarded a Doctor of Law degree to Weaver, who had been elected a trustee of that institution some time before. Weaver was also very involved with various activities and societies. He was a member of: the Union League of Philadelphia; the Lotos of New York; Philadelphia Country Club; Gulph Mills Golf Club of Philadelphia; Metropolitan Club of Washington, D.C.; Williamsport Country Club; Ross Club of Williamsport; the Pennsylvania Society (New York City); and the Surf Club of Miami, Florida. Governor John K. Tener of Pennsylvania appointed Weaver a member of the commission to select the site and build the Industrial Home for Women, which was constructed at Muncy, Pennsylvania in 1920. John Heisley Weaver married Ida Irona Davidson, daughter of Alexander Davidson of South Williamsport, Pa., on April 28, 1887. They had two daughters: Phoebe (who later married John Farrell Macklin) and Marion, (who was first married to Robert Simpson Kampmann, and later to E. Hall Downes). On April 26, 1934, John Heisley Weaver died at his home in Merion, Pennsylvania and was buried in the Weaver mausoleum in Wildwood Cemetery, Williamsport, Pennsylvania.